It seems to me that there are some tags that if they are the only ones on a post (or even if they are mentioned at all) pretty much make the question off topic. Perhaps these tags should have a warning similar to that appearing on the blackberry or they should be removed or something else. Some examples are: legal,e-commerce,illegal,shopping (though there are some questions that are tagged shopping that are not closed, I think many of them should be) amazon, amazon-web-services,automotive,bing-mapsblog, blogger ,blogging, bloglines, blogspot, box, c, c++, c#, cellular, cellular-internet, classified, cloud-storage, online-backup, copyright, culture,dropout, ebay,economics, facebook. Would it be possible for a mod or someone else to either remove these tags, or make it clear somehow that they are used in a totally different way than they are generally used? For example, if legal is talking about a filename, then that is fine, but that is generally not the way that it is used. While I could submit a wiki tag edit, it would then just be confusing as it would have nothing to do with the question. 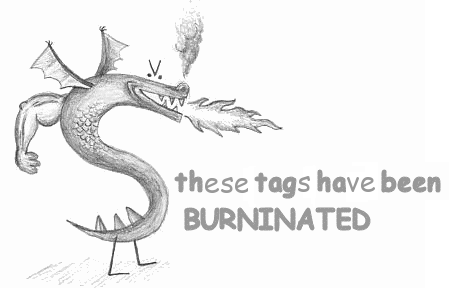 There are also tags that just don't say anything (meta tags?). Some examples are: advice,angry, attack, complete, create, custom, daily, dead, digital, dreaming, exam, exam, exists, express (least the way it is used now, i.e. inconsistently) eye, fail, failed, failing, family, career,cost, cost-benefit, cheap, eula,budget. These tags should be removed I think. Please make sure that if you are using this tag, your question conforms to the FAQ, namely that it is about computer hardware or software. After getting the first two accepted, the rest were rejected (I assume as I can no longer submit edits for seven days). advice,angry, attack, complete, create, custom, daily, dead, digital, dreaming, exam, exam, exists, express (least the way it is used now, i.e. inconsistently) eye, fail, failed, failing, family, career,cost, cost-benefit, cheap, eula,budget. Not the answer you're looking for? Browse other questions tagged discussion support tags meta-tags .